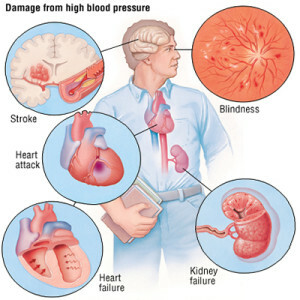 Hypertension is also called “High Blood Pressure”. It happens when the pressure of blood increases than regular or normal pressure of blood. Normal or regular blood pressure is recognized globally. Blood pressure readings greater than these standard levels are considered as high blood pressure. There are no symptoms by which you can know that you are suffering from hypertension or not. But when it happens: it causes Headaches, Dizziness, Ringing in the ears and Fatigue. When you measure your blood pressure yourself or get it checked by doctor or nurse then you can know about your blood pressure. Systolic Pressure which shows the pressure generated by heart beating to pump the blood in whole body. Top numbers represents the systolic pressure. Diastolic Pressure represents the pressure of blood vessels between heartbeats. Lowest numbers represents the diastolic pressure. Still no one knows the appropriate or actual causes of hypertension. But some things increase the chances of high blood pressure. These include no involvement in physical activities, eating salt-rich diets, obesity, alcohol, smoking, age factors and family genetics history. Presence of any of these factors can result in hypertension. You should do aerobic exercise, swimming will be more suited. Avoid eating salt-rich diets and try to eat fruits and vegetables in which there are low fats. Reduce obesity and try to maintain desired body weight. You should limit or avoid from alcoholic beverages. For further information, tests or proper treatments you can reserve appointment with us at Z Clinic or call us at 863.420.7617 or email us at info@zclinic.org confidently.